You might be enamored with the siren song coming from Palo Alto Networks, Bank of America, or Energy Transfer Partners. It's in your best interest, though, to steer clear. There are many ways that buying stocks can lead investors into a trap. Maybe the company's prospects don't meet expectations, or its underlying business isn't completely understood, or the management team is promising something that seems almost impossible to deliver. These sorts of issues almost inevitably lead to investors losing a lot of money. So we asked three of our contributors to highlight tempting stocks that are nonetheless best to avoid. Here's why they picked Palo Alto Networks (NYSE:PANW), Bank of America (NYSE:BAC), and Energy Transfer Partners (NYSE:ETP). Tim Brugger (Palo Alto Networks): Though many have finally lowered their expectations, there's no shortage of pundits suggesting that the recent drop in Palo Alto Networks' share price has made it an attractive growth opportunity. Don't buy in, however. With an average price target of $148.46, analysts following Palo Alto still see a 33% upside from its closing price of $111.77 on March 24. However, as last quarter demonstrated -- yet again -- the company is no longer generating ridiculously high revenue gains. That's significant because it seemed many analysts and investors were quick to overlook its sky-high spending and mounting losses because of its top-line growth. But those days are long over. Last quarter, Palo Alto's sales totaled $422.6 million, good for a 26% increase year over year. The problem is that despite the inevitable slowing of its revenue growth, Palo Alto's combined cost of revenue and operating expenses jumped 24% last quarter to $474 million, which was the primary culprit behind its earnings-per-share loss increasing to $0.67 compared to $0.66 a year ago. To make matters worse, Palo Alto forecast revenue of $406 million to $416 million in the current quarter, which equals a paltry 17% to 20% improvement year over year. The days of 50% or better quarterly revenue growth are long gone, yet the company's spending simply won't slow down. That's a losing proposition if ever there was one, which is why Palo Alto stock is best avoided, however tempting it may seem. Jordan Wathen (Bank of America): In the world of financial stocks, Bank of America has seemingly sucked in every last investor. Shares now trade for 70% more than they did at this point last year. The entirety of the share price increase can be attributed to changing expectations for interest rates and inflation. Just a year ago, investors were pondering deflation. Now, it seems, everyone expects inflation to ramp higher on the back of government infrastructure spending, tax reform, and a myriad of policy proposals that are still in the "idea" phase. Bank of America is an incredibly asset-sensitive bank, meaning that it has more to gain than most banks should interest rates continue on their upward trajectory. If rates change course, however, it has more to lose. In my view, it makes more sense to pay a higher premium for bank stocks with substantial and recurring fee income than a premium for a bank that is all about the direction of interest rates. Tyler Crowe (Energy Transfer Partners): I can certainly see the appeal of Energy Transfer Partners, particularly as it is going to merge with its sister master limited partnership, Sunoco Logistics Partners (NYSE:SXL), and sports a distribution yield of 11.8%. The combined entities will have a much better balance sheet thanks to Sunoco Logistics Partners and a larger, more diverse set of development projects thanks to Energy Transfer Partners. One thing to consider, though, is that this deal isn't necessarily getting done from a position of strength. According to management, there are two strategic rationales for this deal. Personally, it is hard to see how either is necessarily a great sign for investors. One reason is to accelerate Energy Transfer's deleveraging efforts. Energy Transfer has loaded up on debt over the past few years to pay for development projects, and this has taken a toll on the balance sheet. Also, according to a recent investor presentation, Energy Transfer "would need to consider a distribution reduction in the range of 15[%]-25%, subject to a number of assumptions, in order to reduce leverage and increase distribution coverage to strengthen ETP's financial health and future cash distribution growth profile." So, basically, Energy Transfer Partners didn't wisely balance growth and fiscal discipline and now needs the support of Sunoco to get it out of a jam. 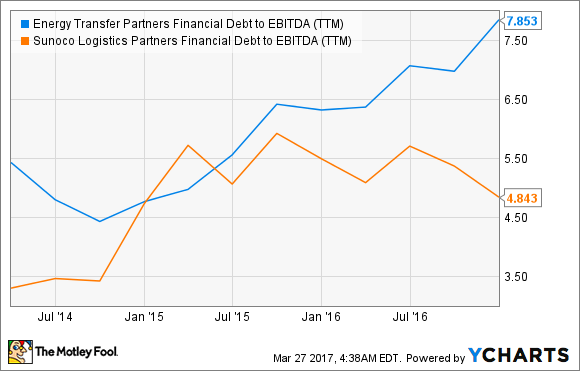 ETP Financial Debt to EBITDA (TTM) data by YCharts. While this may be a good move in the short-term, some long-term ramifications still might sour this deal. As part of the merger, the management team at Energy Transfer Partners will be the ones to assume command of the combined entities, while executives at Sunoco Logistics Partners will be relegated to lower-level roles. If Energy Transfer Partners' management couldn't show financial discipline with just one company, why should we assume they can do it with a combined one?